Chirper was an early computer network that allowed people all over Scarfolk to communicate with each other via short messages called 'Chirps' in 140 characters. It was allegedly created by a psychic and telepath called Warwick Webb who lived in a caravan to avoid detection. Chirper let people discuss social issues, vote on them almost instantaneously and deliver the results via telex to the council without needing to go through swathes of red tape. Democracy no longer needed to be something that only occurred only once every four years on election day; users on the Chirper network could freely interact with political issues twenty four hours a day, seven days a week and they no longer needed politicians to represent them. The council was unnerved. It had already spent millions on town planning that prioritised impersonal, widely-dispersed concrete conurbations, which discouraged people from leaving their homes and mingling on the streets where they could share potentially dangerous ideas. Chirper bypassed this plan and permitted mass democratic interaction on an unforeseen scale. When a Chirping campaign snowballed, pressuring the council to reduce the dose of truth drugs in the water supply, the council had enough and closed down Chirper. They couldn't control it. The council warned that democracy could collapse if average and below-average people were permitted to "exploit it willy-nilly for the benefit of themselves and others". "Democracy", a council spokesman said, "can only work if it is protected from the whims of the people. Democracy can only be preserved if it is governed by self-appointed leaders who decide when and how it should be applied. It should therefore be subject to cuts. For this reason, and for the good of society, we propose that the next general election be postponed for at least 16 years." 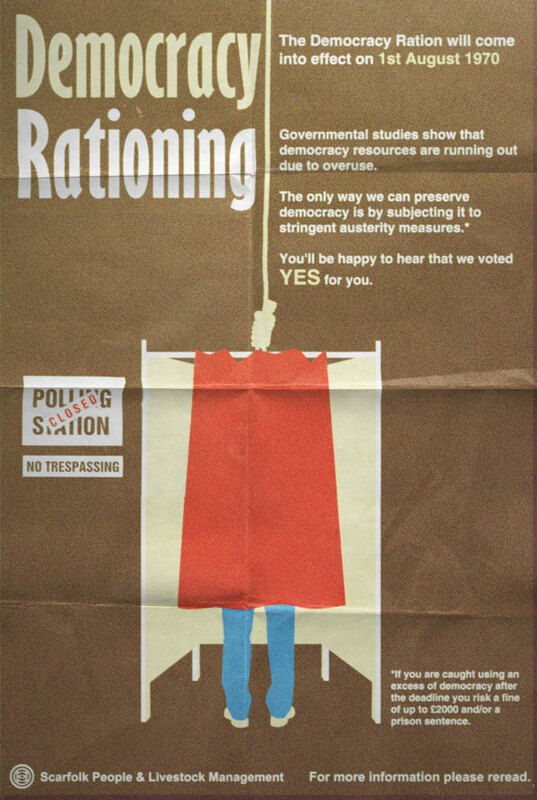 Below is a Democracy Rationing public information poster from 1970. 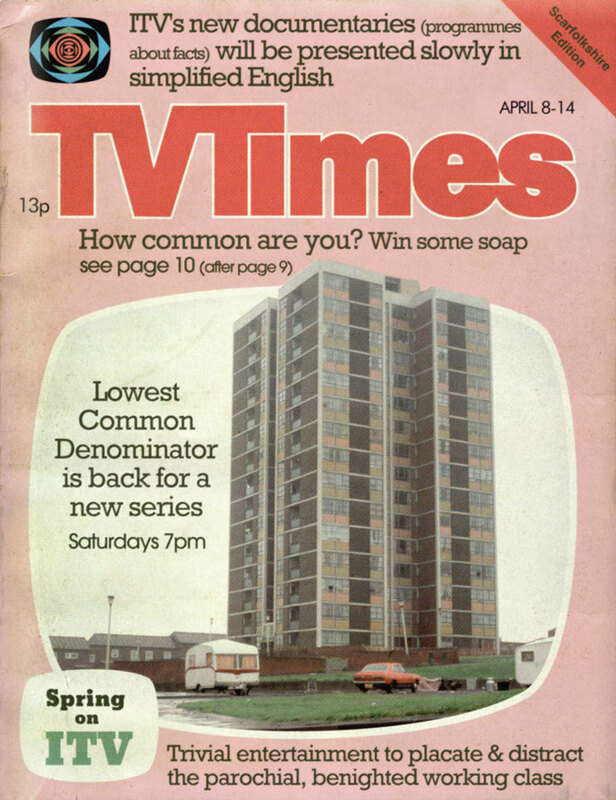 Throughout the 1970s, ITV programmes were tailored to mollify the proletariat. Talent shows, low-IQ quiz shows and sitcoms about average working people were carefully constructed to mislead viewers into believing they were important. A 1973 survey showed that 87.5% of politicians deemed their working-class constituents to be less important than a second family car or having regular bowel movements. The concept of a functioning 'society', of which the working class believed they were a valuable part, when in fact they were little more than consenting serfs, had been invented by an eight-year-old hobby virologist who worked part-time for the government in the Department of Domestic Propaganda. "When people think they are important they buy expensive continental wines and Custard Cream biscuits, and they won't even notice if they've misplaced one or two of their many children". Indeed, the aforementioned 1970s survey indicates that 78% of adults would have rather lost a child than a biscuit. Although there were genuine cases of children fatally biting people in 1970s Scarfolk*, historians now believe that there were far fewer incidents than was originally thought. It is now believed that the government exploited the widespread fear of SIDA (Serious Infant Dental Assault) simply to silence children. The state had spent millions of pounds indoctrinating adults into accepting its prescribed view of reality, but children, who were yet to be intellectually and emotionally conditioned, were prone to asking questions. Even a simple enquiry could undermine an adult's strictly-controlled psychological servitude and set him back years. Children up to the age of seven had to wear a muzzle, which was provided by the Notional Health Service, and when they were old enough they were fitted with special safety dentures which were made from lead. So heavy were these dental implants that children found it virtually impossible to open their mouths, restricting them to only uttering a word or two. The scheme backfired when a group of muted children naturally developed telepathic abilities and tricked the county's dentists and orthodontists into boarding a mysterious black bus, which was never seen again. *In 1971 six year old Kimberley Twix accidentally ate two members of her family, a social worker and the arm of a special forces soldier who was dispatched to contain the hungry child. Provoking acts of terror has always been a national pastime. In November 1605 Guy Fawkes, after much conspiring and careful planning, very almost blew up Parliament. Throughout the 1970s this historical moment was celebrated annually to demonstrate to children just how much one can achieve if one puts one's mind to it. In 1970s Scarfolk, young terrorism enthusiasts could apply for state funding for their amateur acts of terror. If their applications were successful they were permitted to attend a council course, which furnished them with rudiments such as car bombing, hijacking and guerilla-style complaining. They were also taught how to make their own balaclavas using the knitting pattern and free knitting needles which were included in a 1976 edition of Pretty Girl Weekly, an issue which sold out 3 times over in Belfast. 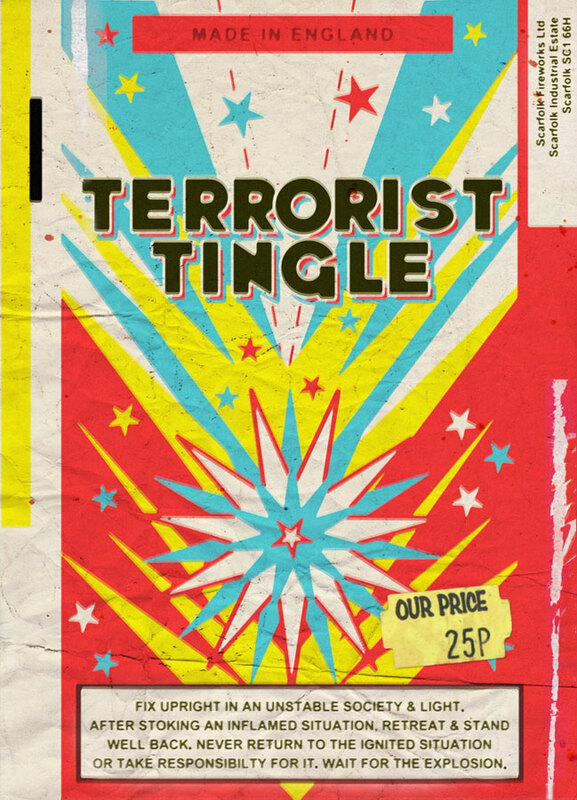 Below is a 'Terrorist Tingle' firework casing from 1978. 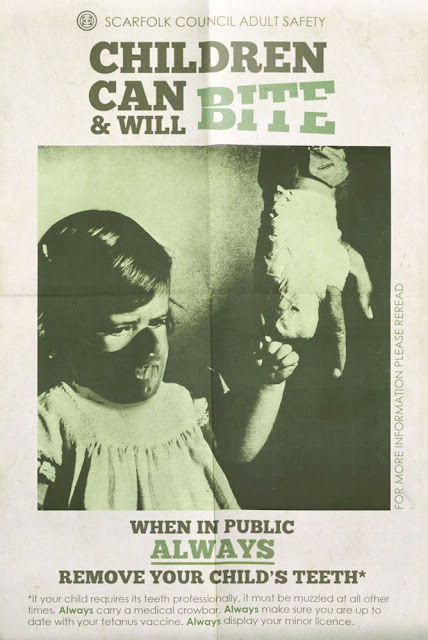 When Scarfolk Council issued the poster below in 1972, it was met with complaints from parents, teachers and arsonists. While the poster does offer the safety guideline of an 'arms length', it does not specify how long that arm should be: The arm of a policeman (the long arm of the law) is of course much longer than the arm of a 6 month old baby (the short arm of a largely useless, albeit nutritious imbecile). Because of this governmental vagueness, come Bonfire Night, many adults needlessly suffered nasty burns when trying to set fire to their children. Something clearly needed to be done. The council scoured the town until they found a resident whose arm they deemed to be an appropriate length. This they amputated then sent to schools, scout groups and civic centres so that they could each take a measurement. The arm was put on display in the council foyer, but was eventually returned to its owner when Scarfolk went metric. If you're wondering why people might want to set fire to their children, you'll have to wait until next week to find out. In the meantime, Bonfire Night Part 2 will be posted later today. 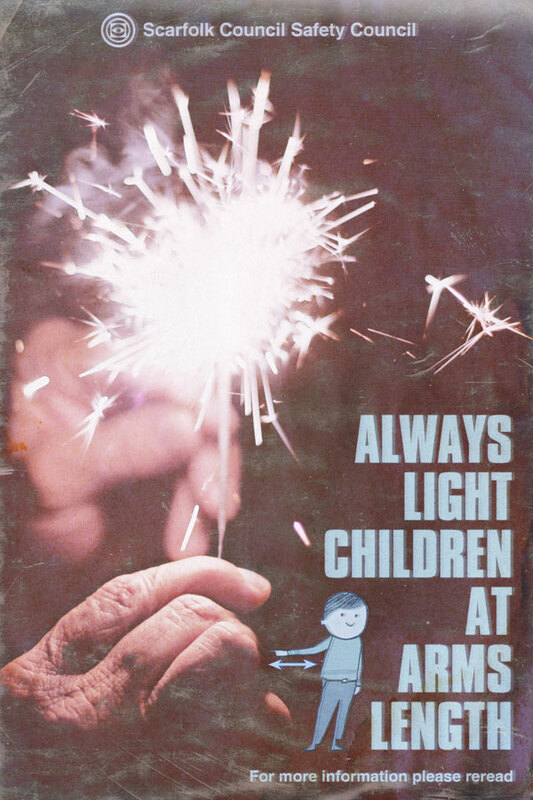 Labels: 1970s, bonfire, children, Council, fireworks, guy fawkes, health & safety, PIF, PSA, Public Information, Scarfolk, sparkler.